Boy I had a fun weekend! 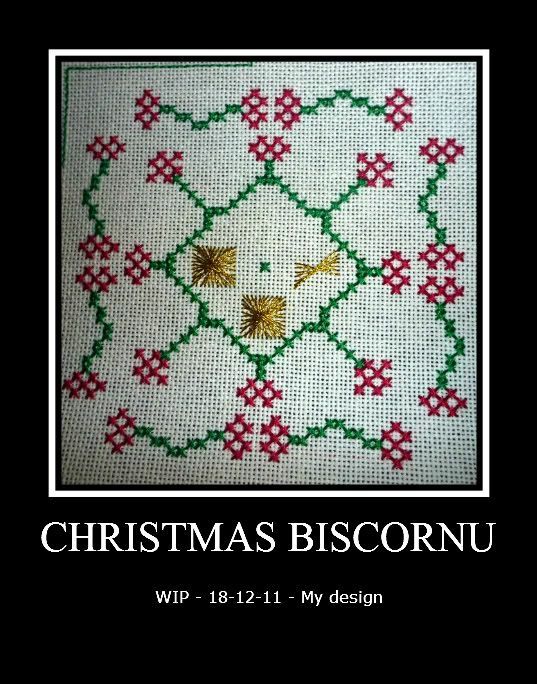 I managed to stitch quite a lot of the day Friday before going out dancing for the end of the year party. I don't go dancing enough anymore I keep falling asleep and can't keep going. Phill still dances every week and he is even teaching classes now. (Oh we do Modern Jive) But with working so much I find I just want to sit and stitch in the evenings and relax though I have made a pact to go dancing every FRIDAY in the new year... we shall see how long that lasts. Anyway that was Friday! Saturday I spent the morning at the hairdressers getting my hair cut and coloured. I will post photos of my hair cut up but in a seperate post. Saturday afternoon I stitched and then cooked dinner Saturday night. We watched the first part of Going Postal by Terry Pratchet the second part comes on next week. I spent the night stitching on Boxers and this is where I left it! They look so cute :D You can really start to see the whole shape of this dog! I love the colours in these dogs. 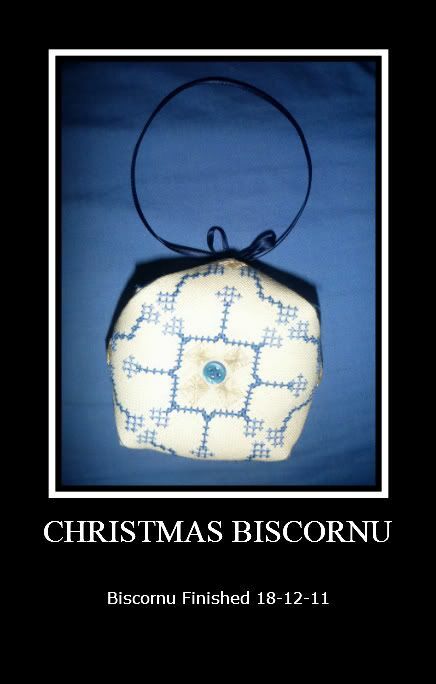 I tied a bow in the ribbon and sewed it onto the top of the biscornu and then glued the ends a little way down the edge. This way it is more versatile. 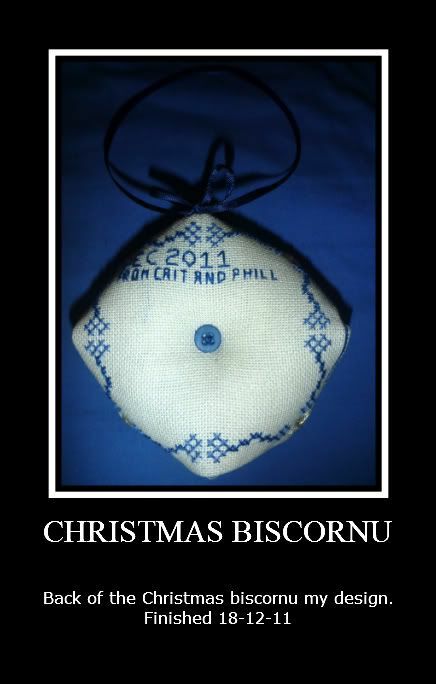 And I started the next one to give to Phill's Grandparents. This one is very Christmasy! I love the ways the different colours are changing this design even though they are all based off the same design. Well I had a busy weekend! I stitched and stitched and got a lot done. I will say it again. I LOVE your boxers. You are making good progress. Wow, you got so much done over the weekend, and it all looks great! Congratulations! 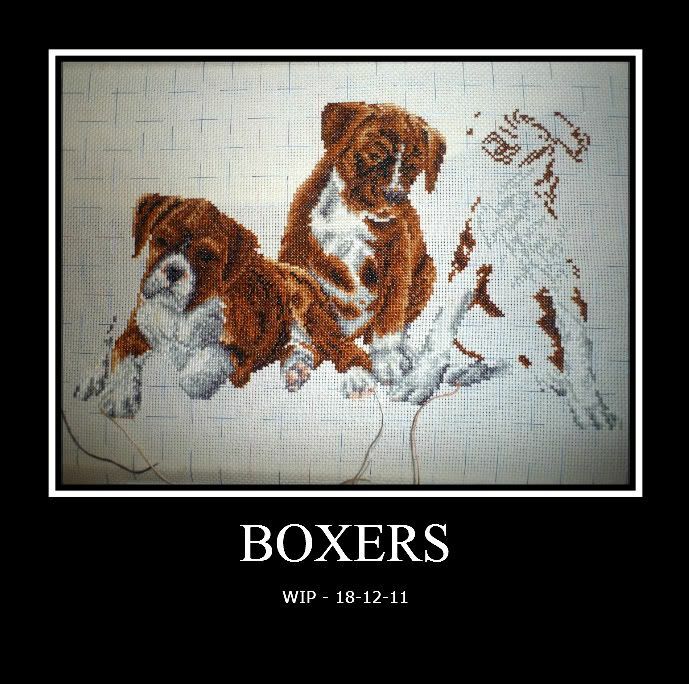 It's been really interesting to watch your progress on the boxers, though, and I hope you continue to move so quickly! 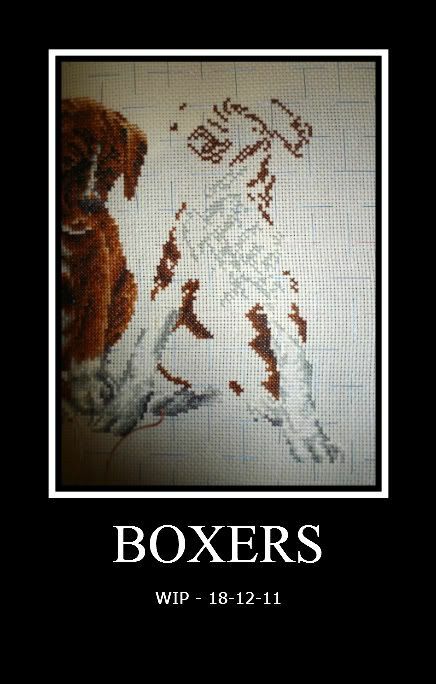 The boxers are GREAT, i have to show this one to a friend at work. She has a boxer at home and i think that she will love this design. The boxers are so cute! You are making great progress on them. The biscornus are very pretty. They are a lot of fun to make, aren't they? You got a lot accomplished! The Boxers are darling!